As is often the case with folk musicians, we often play around with other musicians that we meet at jams and festivals throughout the year. Sometimes this leads to forming other configurations that expand our repertoire, and is just plain fun. Cliff met up with Brian Pearson at their shared CSA (Community Supported Agriculture) cooperative. 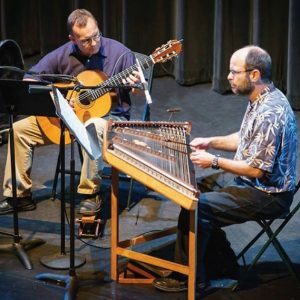 After volunteering their music for the yearly organic festival, they found that classical guitar and hammered dulcimer were a good mix. You can learn more about this combo at tachyonmetry.com. Cliff and Rob teamed up with their long-time friend Norm Williams for this pairing. 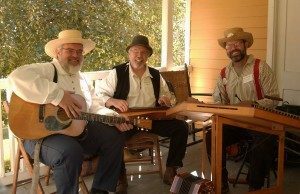 They tend to play old-time American music and feature the hammered and Appalachian dulcimers. You can learn more about this combo at dulcimerboys.com. QUADAS is a group of good folks who are interested in learning more about playing the hammered dulcimer, mountain dulcimer, and/or autoharp. We come in all different shapes and sizes and skill levels. Some of us are just starting out on one of these instruments and others of us have been playing for years, but all of us can learn from one another.